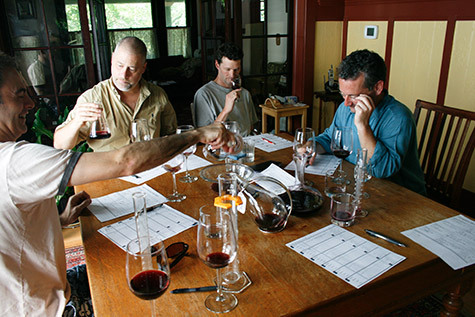 It was a hot afternoon, but five of us coolly assembled to taste through each of our four main wines — Cabernet Sauvignon, Merlot, Cabernet Franc, and Syrah — to determine what part they’ll play in this year’s Peugeot blend. Lovely cherry/raspberry nose, but maybe a bit on the hot side. Tart, but alive. Ripe raspberry and blackberry, with a touch of pepper. Elegant, generally round and full throughout, but fading quickly on the finish. 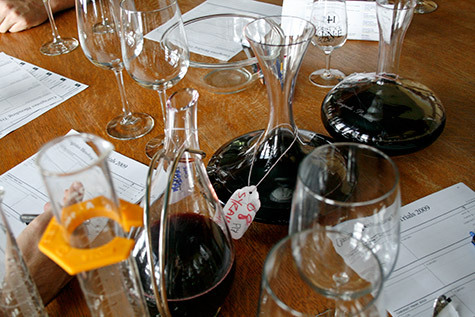 Grippy tannins on the finish — good for some, a bit much for others. Cocoa and minerals. Maybe a little monotone. [Mike adds] The first Cab I could have with salmon. Rich, dark, chocolately, fruity, flowery nose [one taster called it “swampy,” though that appeared to be the outlier, thankfully]. Good body, with nice, simple (but not too simple) flavor. Builds in mouth to a complex peak, clean. medium-length finish. Could be a tad hot, but could also be the crisp acid profile. Overall, my two cents is that this is a solid, full merlot, maybe a bit on the simple side but saved from that ignominy by acid and alcohol, enlivening it in the mouth. A subdued, but Franc-y nose [seemed like it was slumbering during this tasting]. Dusty, a little grassy, maybe a little pinot grigio and “freshly sharpened pencil.” Good body (though for some, not great) in the mouth, and very lovely acidity. One taster called it our best Franc yet, with a focused, persistent finish. Licorice, tar, and smoke, with some added cinnamon and cola from the Oregon oak on the nose. Syrah-like white pepper, licorice and an rich, explosive start, but surprisingly unsubstantial, fading fast. Solid, but not jammy. Having tasted the syrah over the last year, we all felt (okay, hoped) it was going through a bit of a dumb phase, an adolescent exploding with feeling and then sulking in the corner for the rest of the night. That theory is bolstered by the fading, but still present prickling of tiny bubbles in the barrel — it may in fact still be finishing malolactic, even if paper chromatography suggested otherwise. In any case, we weren’t confident the Syrah was really leveling with us about its intentions toward our daughter, so we decided to keep it out of the blend and let it sit for another 6 months in a neutral French oak barrel. That’ll teach you not to forget the corsage, huh, punk? 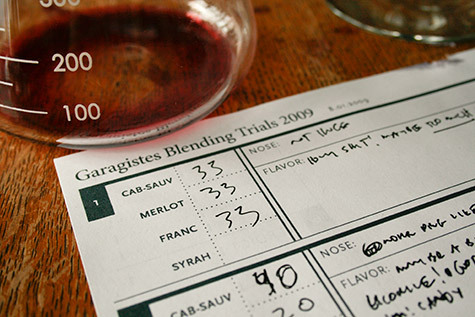 So then it was on to blending trials, trying different proportions of each of the grapes to see which clicked. The vinyl-reverent 33-1/3 (of each) blend we tried first was simply huge and burly, too much merlot bass muddying the sound. Next, 40CS 20M and 40CF juiced the nose more in the Franc direction, which is definitely a hallmark of the Peug’. But while it was pretty substantial in the mouth, we all felt it was too candy sweet — again, the merlot throwing too much of its substantial weight around. A tweak to 45CS 15M and 40CF produced better results, with better balance and less candy, and a hit of chocolate. Still, though, there was an emptiness pooling in the middle of it, so we tried one more tweak: 45CS 17.5M and 37.5CF. Bonanza. But more importantly: decimals! We’re finally real winemakers! Of course, will our crude, half-a-bucket-of-this, spill-a-bit-of-that workflow in blending 130 gallons of this actually mirror this laser-etched proportion? Who cares?! We can finally put a decimal-precise blend on the label, and chicks dig that. Anything to add? I didn’t think so. Anyway, to the extent our blend comes close to what we concocted, we think it’s going to be the best Peugeot yet. That lovely Franc nose wafting above cherry and raspberry, coaxing you into a luscious, multi-layered feast of dark fruit and a hint of cocoa. It’s easily the most robust Peug yet, but not without sophistication, a lovely balance of Cab brains, Merlot brawn, and Franc wit.